If you're trying to eat healthier but are finding it difficult to stick to your diet because you're hungry all the time, it's very likely that something's missing from your diet. 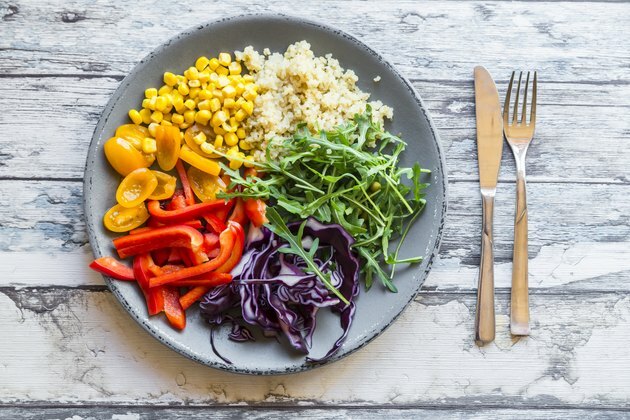 A healthy diet that helps you achieve and maintain a healthy weight and improve your blood cholesterol and sugar levels should provide you with all the energy you need without feeling hungry before the next meal rolls around. You may be hungry after eating a healthy meal for many reasons, such as insufficient calories, protein, fat or fiber. Some dieters believe that healthy eating means eating very little food or choosing low-calorie versions of your usual foods. Although it's true that many Americans eat more calories than they need, which contributes to the growing obesity epidemic, starving yourself is not the solution. For example, if your breakfast only consists of a small packet of oatmeal with 1/2 cup of skim milk, you have a big vegetable salad with 1 ounce of chicken and fat-free dressing for lunch, and then have 1/3 cup of pasta with marinara sauce and steamed broccoli for dinner, you're not getting enough calories. Starving yourself is not a good way to lose weight because it makes you feel deprived and suppresses your metabolism, sending your body into starvation mode, which makes it more difficult for you to lose or maintain your weight. If you don't include enough protein in your meals and snacks, this may be the reason you're still hungry after dinner. Protein is the best nutrient to help you feel satiated and full for longer, according to Health.gov. The Harvard T.H. Chan School of Public Health suggests that your daily protein intake should be about 7 grams for every 20 pounds of body weight, divvied up among your meals and snacks. To arrive at an approximation of the amount of protein you need to consume daily, divide your weight by 20; then multiply the result by 7. Foods to fulfill your protein value might look like a breakfast of one or two eggs with 1 to 2 ounces of cheese or 2 tablespoons of almond butter and 1/2 cup of cottage cheese. Lunch could entail a palm-size serving of chicken breast or canned tuna that's about the size of a deck of cards, and dinner might include a serving of salmon, lean beef, beans or baked tofu that fills about one-fourth of your plate. If you're like many dieters who avoid fat completely by choosing fat-free and low-fat products out of fear of gaining weight, this may explain why you feel so hungry when you're trying to eat healthy. Like proteins, fats contribute to satiety, in addition to enhancing the flavor of your meals and the absorption of fat-soluble nutrients. Include healthy fats in each of your meals to avoid feeling hungry after a couple of hours. For example, add nuts or nut butter at breakfast, avocado slices and a vinaigrette made with olive oil and balsamic vinegar on your salad at lunch, and 1 ounce of your favorite full-fat cheese at dinner. Fiber is mostly found in plant-based foods such as vegetables, fruits, nuts, seeds and whole grains. Make sure your healthy diet contains plenty of fiber to help keep you feeling full longer between meals. Soluble fiber is especially helpful because it forms a gel that slows the digestion process, providing you with a constant source of energy for hours. For example, have a bowl of old-fashioned oatmeal for breakfast or have Brussels sprouts or asparagus with your scrambled eggs and apricots or an orange for dessert. Or add ground flaxseeds or oat bran to your yogurt, edamame to your salad or black beans to your soup. Consider experimenting with a vegetable, like okra, to serve with dinner. Read more: 19 Sources of High-Fiber Foods — Some May Surprise You!